Osteo Complex contains glucosamine in the most concentrated (83% glucosamine) form of glucosamine hydrochloride and natural anti-inflammatory formula: Boswellia extract, Bromelain, Nettle leaf. The human skeleton has 206 bones. Bone building continues throughout our life, as the body constantly renews the bones’ living tissue. Bones begin to form in a mother’s womb, until about 30 years of age bones are actively being built and strengthened, but as a person ages, the bone mass starts to decrease slowly. Strong bones are the result of what we eat and what exercise we take from early childhood until we reach peak bone mass in our early thirties. During all our life it is vital to maintain and nourish the musculoskeletal system of our body. Any musculoskeletal dysfunctions are accompanied by pain, restrict mobility, and make everyday activities difficult. Healthy diet is essential! Our bodies need a wide range of different nutrients, vitamins and minerals to maintain healthy bones. A diet high in calcium rich foods like low-fat dairy products, nuts, seeds, leafy green vegetables and essential fatty acids is very good for strong bones. For people, whose diet is deficient in calcium, vitamins and microelements, for elderly people and for women during menopause the dietary supplements containing calcium and other essential elements are highly recommended. It is important to maintain normal body weight, to reduce additional burden on our bones. In addition, taking regular exercise - both aerobic and strength/ resistance training, such as walking, hiking, jogging, stair-climbing, tennis, and dancing - is also essential for strong bones. The recommended daily amount of physical activity for adults is 30 minutes on five or more days of the week, for children it’s one hour. Vital at every age for healthy bones, exercise is important for strengthening your musculoskeletal system and preventing osteoporosis. Not only does exercise improve your bone health, it also increases muscle strength, coordination, and balance, and leads to better overall health. Osteo Complex is a unique natural Santegra®’s product formulated to support healthy joint function, connective tissue and bones. Osteo Complex contains glucosamine, beneficial for the joint health. Glucosamine is an amino sugar necessary for the construction of connective tissue and healthy cartilage. Glucosamine stimulates the body’s manufacture of collagen, the protein portion of the fibrous substance that holds joints together and provides a shock-absorbing cushion called articular cartilage – the white smooth surface, which covers the ends of body joints – such as those in the wrist, fingers, toes, ankles, knees, hips and between the discs of the spine. Glucosamine is essential for the connective tissue formation. It stimulates the production of glycosaminoglycans and proteoglycans, two essential building blocks of cartilage. The main source of calcium is food and if the intake is not adequate, calcium is absorbed from the bones. Most people eat well below the recommended amount of calcium. This lack of dietary calcium is thought to contribute to the risk of osteoporosis, which nowadays is considered to be a “hidden epidemic”. About 30% of population (mostly women) has osteoporosis at the age of 50 and almost 50% - at the age of 70. Manganese is an essential trace mineral needed for healthy skin, bones and cartilage formation and maintenance. Manganese is involved in metabolism of carbohydrates, fats and proteins, has antioxidant activity, and protects the body against damage from free radicals. Manganese deficiency can lead to bone and joint deformation. Vitamin C is a powerful antioxidant, essential for the immune system. It is vital to the production of collagen, the "glue" that strengthens skin, bones, teeth, blood vessels, cartilage etc. Vitamin C plays vital role in the support of musculoskeletal system and lowers the risk of osteoporosis. Studies have shown that boswellic acids have an anti-inflammatory action. Boswellia inhibits pro-inflammatory mediators in the body, such as leukotrienes. (8) As opposed to NSAIDs, long-term use of boswellia does not appear to cause irritation or ulceration of the stomach. Nettle, or stinging nettle (Urtica dioica) is multivitamin herb. In folk medicine nettle has been used as a diuretic, for arthritis and rheumatism. Nettle’s long-standing use as an anti-inflammatory aid for rheumatism and arthritis has been confirmed with clinical research. In several clinical studies (including a randomized double-blind placebo trial) nettle leaf extracts were documented with anti-inflammatory actions as well as to be beneficial at relieving arthritis pain and inflammation in humans. Nettlle is beneficial for the bones, because it is a natural source of calcium, vitamin C, magnesium, potassium, phosphorus, manganese, silica. Bromelain, derived from the pineapple plant (Ananas comosus), is one of a group of proteolytic enzymes (enzymes capable of digesting protein). Bromelain stimulates enzyme activity, improves digestion and metabolism, and helps to normalize weight. Bromelain can break down blood clotting proteins called fibrins, thereby increasing circulation and allowing tissue to drain properly. Bromelain has been demonstrated to show anti-inflammatory and analgesic properties. Osteo Complex is a unique, scientifically advanced product that provides a multinutritional approach to natural flexibility and increased freedom of movement. Proprietary Blend - 58.5 mg: Boswellia extract (Boswellia serrata)(gum exude), Bromelain (from Ananas comosus), Nettle (Urtica dioica) leaf. As a dietary supplement take 2 tablets 2 times daily with a large glass of water during meals for 1 month. Individual intolerance. Children, pregnant and lactating women should consult their physician before taking this product. Did you know that the human body has 143 different joints? Acting as hinges, levers and shock absorbers, synovial joints allow us to jump, dance, climb, sit and walk. Joints are designed to hold bones close together while still allowing them freedom of movement. The whole of a synovial joint is contained by a ligamentous sac, the joint capsule or articular capsule. The surfaces of the two bones at the joint are covered in cartilage. Of all the layers, it has the highest concentration of collagen and the lowest concentration of proteoglycans, making it very resistant to shear stresses. Deeper than that is an intermediate layer, which is mechanically designed to absorb shocks and distribute the load efficiently. The deepest layer is highly calcified, and anchors the articular cartilage to the bone. 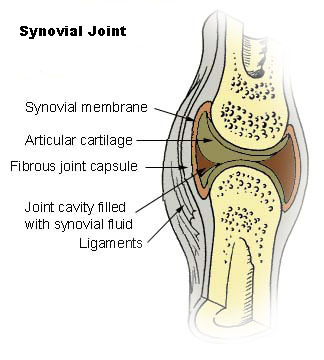 The synovium is a membrane that covers all the non-cartilaginous surfaces within the joint capsule. It secretes synovial fluid into the joint, which nourishes and lubricates the articular cartilage. The synovium is separated from the capsule by a layer of cellular tissue that contains blood vessels and nerves. Articular cartilage forms a cap at the end of the bones. This cartilage absorbs shock while allowing bones to easily slip and slide across each other during motion. That’s because most of the cartilage consists of water - in fact, it’s 65 to 80 percent water! The balance is made up of collagen and proteoglycans, which give cartilage its cushioning ability. Cartilage is composed of molecules known as proteoglycans, which are deposited within a matrix of collagen fibers. This complex traps water and helps give cartilage its flexibility, resiliency, and resistance to compression. Proteoglycans are a combination of protein and carbohydrate molecules. Higher levels of glucosamine within the cartilage-producing cells (chondrocytes) are critical for production of adequate amounts of proteoglycans. By helping to repair and rebuild the cartilage matrix, glucosamine can actually support healthy joint function. Glucosamine hydrochloride demonstrates more stability, purity, and higher concentration when compared to glucosamine sulfate. During the preparation of glucosamine sulfate, sodium and potassium are added, and about 83 percent of glucosamine hydrochloride is actual glucosamine while only about 63 percent of glucosamine sulfate is actual glucosamine. Therefore, one gets more glucosamine per capsule form glucosamine hydrochloride than from glucosamine sulfate. 3. Delafuente JC. Glucosamine in the treatment of osteoarthritis. Rheum Dis Clin North Am. 2000 Feb; 26(1): 1-11. 4. Rindone JP, Hiller D, Collacott E, Nordhaugen N, Arriola G. Randomized, controlled trial of glucosamine for treating osteoarthritis of the knee. West J Med. 2000 Feb; 172(2): 91-4. 5. Chevalley T., Rizzoli R., Nydegger V., et al. Effects of calcium supplements on femoral bone mineral density and vertebral fracture rate in vitamin D-repleted elderly patients. Osteoporosis Int. 1994;4:245-52. 6. Dawson-Hughes B. Calcium, vitamin D and vitamin D metabolites. Osteoporosis 1996. Ed. S.E. Papapoulos et al. Elsevier. Amsterdam, Lausanne, New York. 1996; 299-303. 7. Safayhi H, Mack T, Saieraj J, et al. Boswellic acids: Novel, specific, nonredox inhibitors of 5-lipoxygenase. J Pharmacol Exp Ther 1992;261:1143-6. 8. Singh GB, Atal CK. Pharmacology of an extract of salai guggal ex-Boswellia serrata, a new non-steroidal anti-inflammatory agent. Agents Actions 1986;18:407-12. 10. Müller-Fassbender H, Bach GL, Haase W, Rovati LC, Setnikar I. Glucosamine sulfate in osteoarthritis of the knee. Osteoarthritis Cartilage 1994; 2:61-69. 11. Kimmatkar N, Thawani V, Hingorani L, Khiyani R. Efficacy and tolerability of Boswellia serrata extract in treatment of osteoarthritis of knee--a randomized double blind placebo controlled trial. Phytomedicine. 2003 Jan;10(1):3-7.